Then ladle the batter into the pan and swirl it so it spreads into the entire surface. Cook until the edges start browning and top seems dry. I use a fork but a spatula would do the trick as well to loosen the edges. Then flip the crepe and let it cook for a few seconds. (I find this is a feel sort-of-thing - you just can tell when it's ready!!) You can make these up to three days ahead. Mix all ingredients except milk. We want it to be thick, not runny. And now the assembly…oops...what about the sauce? Truly you can use any sauce – your own, a jar of Rao’s Homemade. We are biased, we use our own. 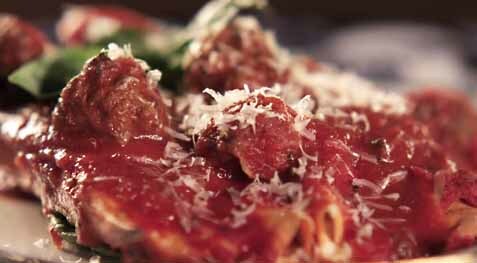 Our secret for this particular dish are making tiny meatballs! Take a crepe and spread ricotta mixture in center, fold one edge over the other and place in baking dish that has some sauce spread lightly over bottom. Repeat. We recommend only one layer as it is easier to serve. Bake at 350 degrees for 20-30 minutes. And remember they must settle for at least ten minutes before serving or you will have a runny mess - still delicious, but not pretty. Yield: This recipe makes 80 crepes but can easily be halved or quartered. Freeze some for another time. When I think of our quintessential family heirloom recipe, the one that comes to mind has been handed down from my great grandmother to my grandmother to my mother to me. This is the essence of heirloom meals - savoring yesterday’s traditions today. My featured recipe is manicotti and for all of you who speak phonetically, M-A-N-I-C-O-T-T-I. When I was little I pronounced it manicotti (pronounced in Italian) and most of my friends had a quizzical look on their faces – So I have gotten into the habit of saying it two times – like Tony Two Times from Goodfellas. Manicotti (MANICOTTI) – get it!! I am sure most of you have had manicotti –thinking large tubular noodle stuffed with ricotta (pronounced Italian style) R-I-C-O-T-T-A – there’s Tony Two times again!! Well my family recipe will transform your idea of manicotti forever!! This is our recipe for heavenly light crepes - fill them with luscious ricotta filling and finish with some sauce - the best! !